touches of sense...: Gridlock unmasked. Writing takes me naturally rightwards. I wonder in an instant what might go on in a writer's head who habitually writes leftwards, or downwards, once asked to compose in what for me seems a natural direction. The page becomes an abstraction. It is a lure. The page has more presence than we can imagine. Ceci n'est pas une page. An indication of how a blog page is far from neutral shrieked out at me when when I was invited to write for Edcontexts. I was writing in unfamiliar surroundings. It was like playing cello on a borrowed instrument. OK, it was a blog editor pretty much like any other blog editor, but the formating was all wrong. So all of this is background for my current foregrounded dialogue with Kevin Hodgson which concerns what it is to write in a digital context. Exploring this question, a number of blog posts, scribbles and sketches are emerging. They are a continuation of exploratory work that I have been doing since Rhizo14. I have been lurking on the periphery of #digiwrimo, which I have understood to be an investigation into digital storytelling or writing. Browsing hashtags (that seems so natural to me now) I came across #25wordstory. I have to say that Twitter and haiku both appeal to me for their imposed length constraints, so #25wordstory seemed like fun. The #25wordstory which came out of this challenge was an investigation into the feeling of constraint. It was the spark for a new story game, based on a Soduku grid sort of affair. I set up a #25word by #25word Google spreadsheet and wrote my story across the top of the sheet. The fact of each word being separated in a self-contained cell distorted the flow of the writing. The movement of the cursor from cell to cell changed the relationship with the story. I felt emprisoned by the frame. I felt crab-like or insect-like in my movement. Images of Kafkaesque metamorphosis crept out of the page. I felt a certain degree of claustrophobia. 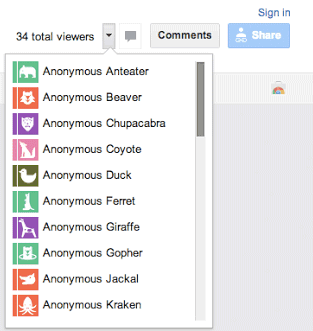 I felt a sudden paranoia when I was joined in the page by a number of anonymous animals. The arrival of Kevin in the sheet, lifted the feeling of paranoia. It is extraordinary how a recognisable avatar can give a feeling of security. Kevin started playing with the constaints, writing stories diagonally, changing unannounced rules. Yes, the rules what were the rules? Caught in the grid, it seemed that we were indeed in a game with implicit rules. This impression was confirmed to me when Susan Watson, I think it was, asked me whether there were any rules? Following the explorations of Kevin in real time, I saw steps, moutains, slopes, appear graphically across the sheet. The grid now had contours. What the hell was/is the story? The story/ies climbed 'up' the sheet. This is one of the reasons that when Kevin talked of it being a "view from above" I was not at all sure that I was looking from above or was inside the story, or whether the sheet was struggling to find a third or fourth dimension. If pushed, I would venture fourth dimension. Tanya appeared in the Twitter stream, and joined in the fun, and discussion sparked around what on earth we were doing in a spreadsheet. Well I had not really thought through the choice of a spreadsheet, it just appealed to me. It was like trying to walk, write or read, through a maze, she said. I myself had a similar impression as words appeared to connect vertically down columns, across rows and diagonally up and down yellow hills. Fragments of stories, unusual combinations of verbs, feelings, prepositions stuck incongrously together hitting up against the frame of grammar, sense, and the spreadsheet enclosure. I suddenly started seeing how apparently absurd constraints were releasing more creative possibilities. Always the same questions of convention, language, writing, game-play, puzzle, authorship, presence and freedom rose up out of the cells. Kevin wrote of considering these stories as landscapes. 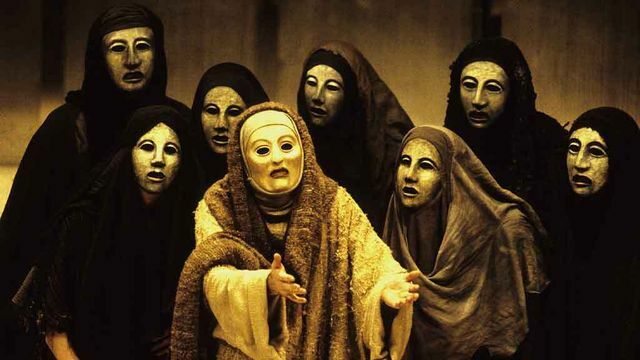 I feel that these spaces are more than landscapes, they are strange actors in a Greek play, masked, choral, disturbing. We are haphazard intruders in a strangely unfamiliar land, a narrative land that we take too much and too quickly as read. I feel we are bumping up against the constraints of our prisons, our homes? This is perhaps a first and an only step that we can knowingly take towards a relative and unsatisfactory freedom. OMG it is, we are, they are, he/she is the FIFTH COLUMN. "I had no choice except to write myself out." Beautifully written post as always, Simon. I love hearing the story behind the emergent art, the etymology of the narrative. When I saw your tweet and followed the link it was without this context...which initself was liberating. I expected to find some fun, out there kind of narrative playground but was shocked to see it in a spreadsheet, which to me has an immediate association with numbers, formulas, process & order. The content inside the cells, appeared anything but. However on following some of the contours, paths laid by others, fragments of meaning started to appear. I'm not certain whether these fragments were laid down by the original writer, evolved through co-writing and additions to an original word, line or letter by another/s, or simply evolved through an interpretation and recombination of previously separate lines by me, in mind...but whatever, however they emerged, they did. And, inspired, I picked up a few threads, and extended them. "chaos" was actually one of my added threads- but it was in the context of "organised chaos"- reflecting the initial reaction I had to the spreadsheet..& then my gradual realisation after exploring the contours, that what initially appeated chaotic had embedded in it, these threads and fragments of evolving meaning. Thanks for the invite to play- always fun - and thought provoking. Thanks also for thie invite. Such fun, such unlimited possibities in what at first glance seems so constrained. I say again, this is a beautiful document. I am working on something right on the outer edge (actually quite beyond) of my technical and personal capacity using your Soundcloud, my own voice, Kevin's song and Explain Everything as a container. It should be on YouTube today. It will be very rough, but I kinda think of it as next steps, as a co-labor, as truly holy multimodal round of song. Row row row that boats boys and girls. LInk to follow. I ain't sayin' it's good, but it is something. Looking forward to that, sounds like we are all on the edge - i like that - new lands to discover :-) have been messin with dj app - not to any effect but it opens up new vistas. I've been following #clmooc since 2013 and have been sharing what you all are doing in my own networks. Why? Because of how you are working together on various project like the one you've described above. You're located in different places around the world, yet you all find time and ways to connect and interact, and create, together. It's not a one-time activity. You've been doing this for nearly 5 years! So far what I hope will happen is not happening nearly as often as it needs to be happening. Yet if one views Kevin, Terry and Simon's past articles, and the #clmooc home page, you'll find Tutor/Mentor in some. I don't write this to self-promote. I write it because in the cities, states and countries where people in my network live, there are areas of concentrated poverty, inequality, lack of opportunity and lack of hope. Heroes need to emerge who try to change these conditions. The ideas I share intend to stimulate their thinking and the ideas they create will hopefully stimulate the thinking of many, many others.